When an expense is added or imported into Craftybase but is not yet linked with a project or a material, it is now considered unassociated. A red exclamation icon will appear next to all unassociated expenses in your list. To associate an unassociated expense, click on the red icon and the associate popup box will appear – this will allow you to choose a project that you want to attribute the expense to. Click the Associate button to close the box and save the expense. If you do not want to associate your expense with any project, leave the No Project option selected and then click the Associate button. This will unmark your expense as unassociated but will not link it to any particular project. 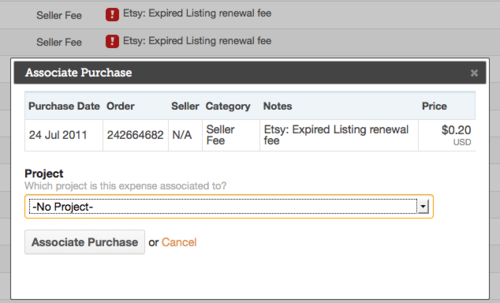 Note for Etsy shopkeepers: The Etsy API (that we use to import all your fee data) currently has a known bug with Renewal Fees that they are working on fixing at the moment. Currently when we import your fees, all renewal type fees will not be associated with their listings so you may need to associate them manually. Alternatively, leave them as associated and when this bug has been fixed by Etsy, they will be automatically re-associated on your next Etsy import.